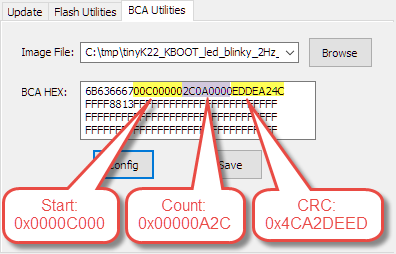 This article explains how to calculate the CRC32 for KBOOT, both from binary and S-Record files and how to insert the values into the BCA (Bootloader Configuration Area). Additionally it gives tips about debugging the bootloaded application. The bootloader is configured with a BCA (Bootloader Configuration Area). As explained in “Getting Started: ROM Bootloader on the NXP FRDM-KL03Z Board“, it configures the ROM bootloader. 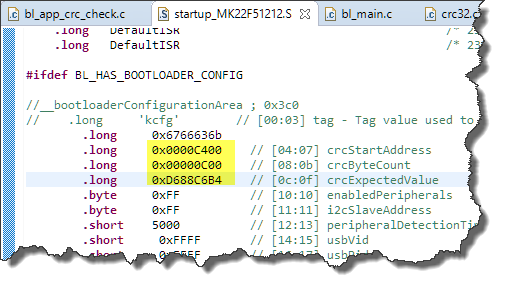 That ROM bootloader for the KL03Z does *not* implement the checksum feature :-(, so I would have to build a flash-flash resident bootloader as explained in “Flash-Resident USB-HID Bootloader with the NXP Kinetis K22 Microcontroller“. 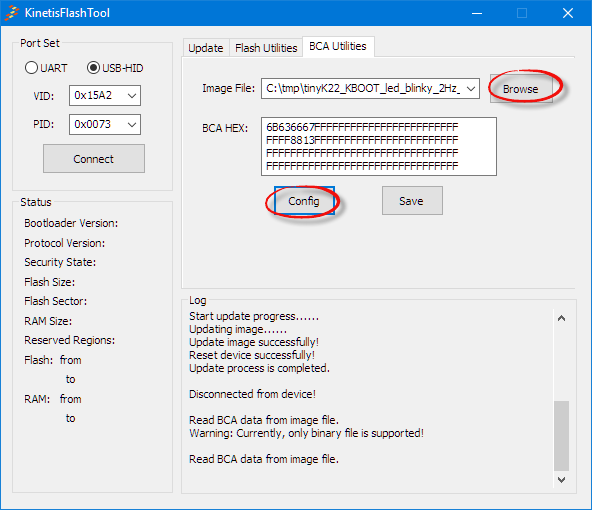 For the flash-resident bootloader, the BCA has part of the application to be loaded as well, and located at offset 0x3C0 right after the vector table located at offset 0x0000. The question is: how to calculate that expected CRC value? But this is a very painful process, and only works with .bin (Binary) files. 💡 Kudos go to Robert Poor (see https://community.nxp.com/thread/462397) who has found out the correct command line to generate the CRC32 needed by KBOOT. -crop 0x1000 0x1004 -Output -HEX_DUMP: Crop everything around the generated CRC32 and dump the output to the console. 💡 Ideally the vector table at 0xC000 and the BCA at 0xC3C0 would be included into the CRC, but KBOOT does not support this, so for simplicity I keep it excluded from the CRC calculation. Means the CRC32 is 0xD688C6B4. It first fills the memory from 0x0000 to 0x1000 with the 0xff filler, then cuts out the area between 0x400 to 0x1000, calculates the checksum and issues it on the console. 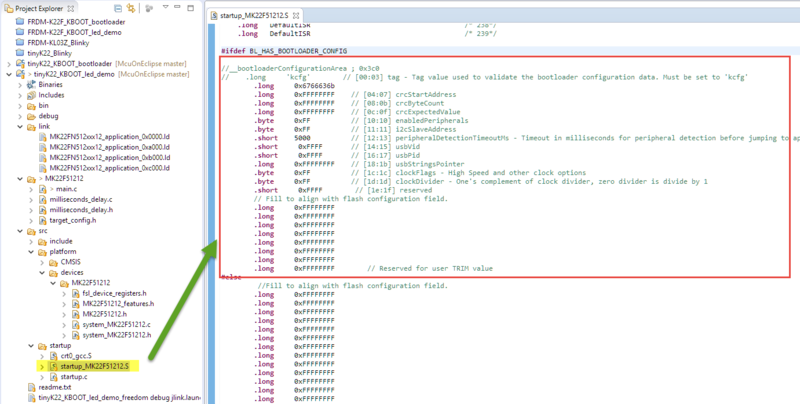 There is one potential problem with the CRC calculation done by the bootloader: If your debugger probe modifies the flash memory for setting breakpoints (e.g. Segger J-Link can do this to get ‘unlimited’ breakpoints (see “Software and Hardware Breakpoints“, then this is changing the code, and as such invalidates the CRC checksum/check. 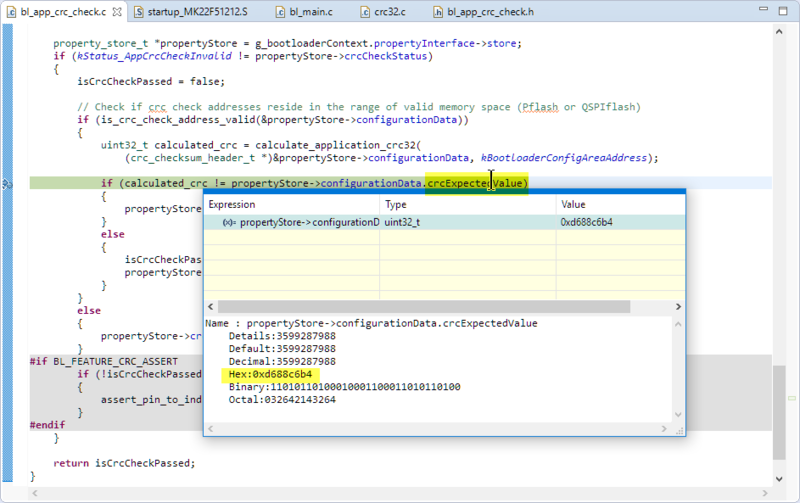 So if loading and CRC-checking application code, make sure you don’t have any breakpoints set in that area. This article describes the manual steps to determine the CRC value and than add it to the application. For automating things with a Python script, see the work of Robert Poor at https://github.com/rdpoor/srec-crc. 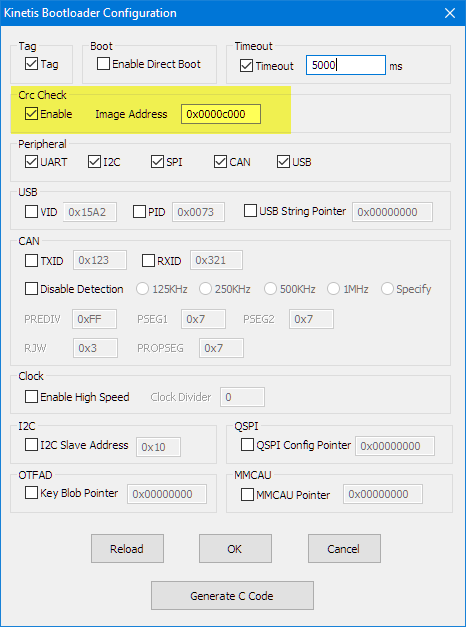 Adding a CRC32 check in the bootloader makes the process more reliable, as it can detect bit in the loaded image. Knowing the correct polynomial and CRC calculation way is not always straight forward. Kudos to Robert Poor who has found out how to create the CRC32 for KBOOT. I’m now able to generate the checksum both from S19 and binary files. I’m doing things semi-automated (calculate the CRC and insert it into the file), and if I find time I plan to automate it further. Until then, have a look how Robert is automating it (see previous section). The projects used in this tutorial are available on GitHub (see the links at the end of this article). This entry was posted in ARM, Boards, Building, CPU's, Eclipse, Embedded, FRDM-K22F, gcc, Kinetis, NXP, tinyK22, Tutorial and tagged ARM, arm gcc, Building, CRC, CRC32, Debugging, Eclipse, Flashing, freedom board, gnu gcc, KBOOT, NXP, open source projects, software, software project, SRecord, technology, Tips&Tricks by Erich Styger. Bookmark the permalink. I have been following your articles on KBOOT and and the KL03. of the application in the BCA (0x03C0). I am also using the ROM bootloader to reflash my application. Is there a way to invoke a KBOOT CRC check other than by issuing a RESET to the microcontroller (via the reset pin; at this point the KL82 will enter KBOOT again) and querying via “get-property 8” command the status of the CRC32 integrity check. The KL03 (and I think as well the KL82) ROM bootloader is closed source (no sources available). I did not see a specific bootloader entry point for the CRC itself, but you can enter the bootloader anytime you want from the application (e.g. see how this is done for the ROM bootloader: https://mcuoneclipse.com/2017/07/12/getting-started-rom-bootloader-on-the-nxp-frdm-kl03z-board/), see RunRomBootloader(). The other way would be to read the CRC info from the image itself and run the same function as in the bootloader. The polynom should be the same I think. You would have to copy that code. 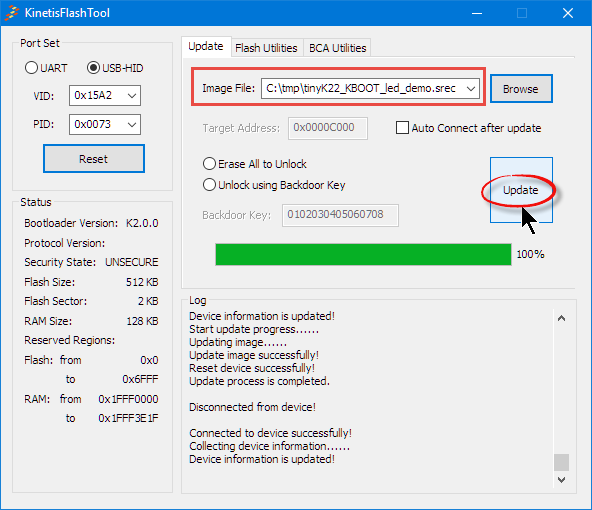 I have added the CRC32 to the BCA area of my firmware, using the Kinetis Flash Tool, and uploaded the firmware via KBOOT. Preparing to send 28784 (0x7070) bytes to the target. Wrote 28784 of 28784 bytes. Which is the correct answer, because there was no CRC32 the BCA sector when the KL82 was powered on. Which is what I was expecting. My question is, if there is a better way to “restart” the KBOOT? maybe I’m still confused. If you don’t have a timeout set for the bootloader, then it will check the CRC32 and if it is valid directly start the application? I’m not sure why it keeps ‘hanging’ in your case. How do you know what is the last index of data? (in this case: 0xD000)? I can’t seem to get the same CRC value as I get via the KinetisFlashTool, and I’m guessing the problem is in the crop data for the crc calculation. 2. I’m working with bin file (using blhost). You did not mention it, but in such case, the byteCount and the startAddress should be hardcoded to the startup_MK64F12.S file, right? because the srec_cat you showed only referes to the crc value. 1. The address range is from the start address (0xc400, inclusive) up to 0xCFFF (0xD000 is *not* included). So 0xCFFF is the last byte. 2. For loading bin (binary files), as the binary file format is just a stream of data, you need to tell the bootloader where to load that data/code with an offset. But this should not have anything to do with the startup code itself?